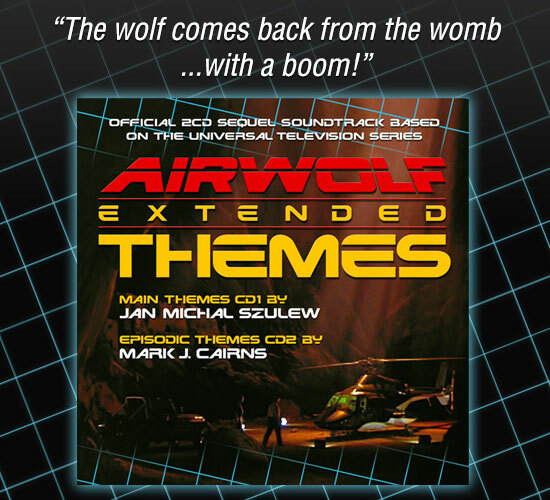 • 42 Tracks of officially-licensed music score based on the Airwolf™ TV Series. • 2CD Set – Special Limited Edition. 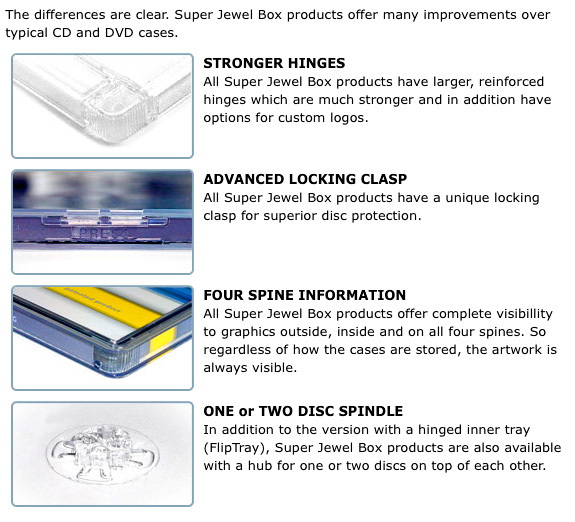 • Super Jewel Case design. • 24-page Cover Booklet including exclusive interview with Airwolf™ episodic composer, UDI HARPAZ. 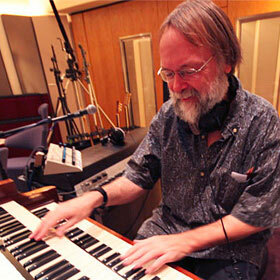 • Booklet contains incredibly rare, new and exclusive, behind-the-scenes photos. UDI HARPAZ and the late BERNARDO SEGÁLL. 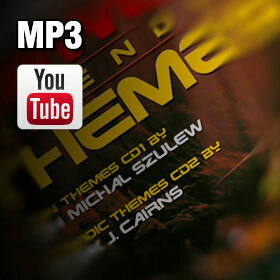 • “Main Themes CD1” contains 22 “Airwolf Main Theme” music tracks performed & produced by Orchestrator & Associate Producer, JAN MICHAL SZULEW. • “Episodic Themes CD2” contains 20 “Airwolf Episodic Themes” music tracks produced by ‘Airwolf Themes’ Creator & Producer, MARK J. CAIRNS. This Airwolf website is primarily dedicated to the music from the high-flying, mid 1980s, American, action adventure, television series called 'Airwolf™' (1984-1986) which starred Jan-Michael Vincent, Ernest Borgnine, Alex Cord, Jean Bruce Scott and Deborah Pratt. 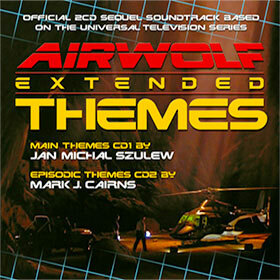 The original music score that we released based on the TV show was the officially-licensed ‘AIRWOLF THEMES’ and was a 2CD, 25-track special limited edition (of 1000 copies) soundtrack album released in 1999 with music re-arranged by Producer [and long-time Airwolf fan] Mark J. Cairns in conjunction with original composer Sylvester Levay [which has so far enjoyed an unofficial World Record for a Television Soundtrack]; later joined by a sequel preview digital downloads-only EP in 2009 called ‘AIRWOLF MAIN THEMES’ EP; with a further expanded, officially-licensed 2CD, 42-track official sequel called ‘AIRWOLF EXTENDED THEMES’ special limited edition (of 2000 copies), which was released at the end of March 2014 again by Mark J. Cairns in conjunction with Bulgarian-Polish Orchestrator & Associate Producer, Jan Michal Szulew. Produced over a 5-year period, this special limited edition soundtrack score is set to get Airwolf fans' hearts-a-pumpin' as it celebrates the iconic work of original Airwolf composers, Sylvester Levay, Udi Harpaz, Ian Freebairn-Smith and the late Bernardo Segáll. Mark J. Cairns has been creating a brand new, fully interactive Airwolf Episode Guide and comprehensive Airwolf Episode List during 2014 (still a work in progress) which will, for the first time, be expanded upon to include focused Airwolf backlinks directly to iMDb, Wikipedia, links to buy the official Airwolf DVD and Bluray releases for the series via Amazon. Generously illustrated throughout with sumptuous images from each individual episode, the new Airwolf Episode Guide features full synopses, Google Translate™ on all pages, interesting background information & episodic reviews of each weekly episode, plus the unique Airwolf Themes exclusive view of analysing the music created within each episode. It is set to become the de facto reference and go-to guide for fans of the Airwolf™ TV series.